14 Then you shall delight in the LORD, and I will make you ride upon the heights of the earth; I will nourish you with the heritage of Jacob, your father, for the mouth of the LORD has spoken. 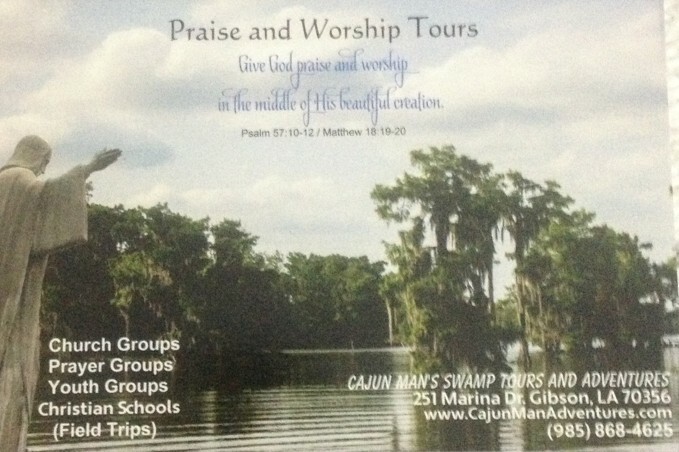 ANY CHURCH, PRIEST, SCHOOL AND/OR PRAYER GROUP CAN SPONSOR A SWAMP PILGRIMAGE ON ANY DAY TO MEET THEIR PARTICULAR NEEDS. THE TOUR FEE IS $15.00 FEE PER PERSON AND THAT IS TO COVER TOUR EXPENSES. ANYTHING OVER $100.00 AND LOVE OFFERINGS WILL GO TO CAPT. GASTON’S LED BY THE SPIRIT HOMELESS MINISTRY BASED IN ANNUNZIATA PARISH IN HOUMA. FOR MORE INFORMATIONS ON THE PARTICULARS AS WELL AS RESERVATIONS CALL CAPTAIN GASTON! RESERVATIONS MUST BE MADE PRIOR TO SHOWING UP AT THE PHONE NUMBER 985-868-4625 OR VISIT HIS WEBSITE BY CLICKING HERE. Pilgrimage leaves landing at 2:00 pm unless scheduled to meet other needs. The details of what you would like to be done should be developed by you but is expected to include at least Divine Mercy Chaplet and Adoration. Add on to that anything you want to do. Boat has sound system and music will be played while traveling. Lite refreshments can be brought on boat. Of course, any tour is subject to be cancelled or shortened due to severe weather at the time of the tour.